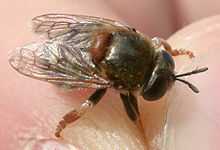 Flies in the genus Microdon are a type of hoverfly. Microdon and its subfamily are different from most other flies because they are myrmecophiles. This means they live in ant colonies (nests). There are more than 350 species of Microdon in the world. Some of these will be split off in time because Microdon has been used as a catch-all for various unrelated species. Most Microdon live in the tropics; 30 species live in North America. Microdon adults are very hairy and look like bees. They are 8 to 15 mm long. The antennae are almost as long as the fly's face. These flies have black or pale (white or golden) hairs, and their bodies are either black or metallic green or blue. The larvae of Microdon flies look strange. They are very round and look like stout little slugs. At first scientists thought they were mollusks and scale insects. They move slowly. Adult Microdon flies do not hover around flowers such as many other hoverflies; instead they remain close to the ant colonies where they grew up. Larvae may be found very deep in ant nests. Some Microdon larvae eat ant larvae (Duffield 1981); others are scavengers, which means they eat dead plants or insects in the ant colony. Most Microdon larvae can only live in the colony of one kind of ant. ↑ Cheng, Xin-Yue; Thompson, F. Christian (2008). "A generic conspectus of the Microdontinae (Diptera: Syrphidae) with the description of two new genera from Africa and China". Zootaxa (New Zealand: Magnolia Press) 1879: 21–48. ISSN 1175-5334. http://mapress.com/zootaxa/2008/f/zt01879p048.pdf. Retrieved 2009-09-11. ↑ Thompson F.C (1981). "Revisionary notes on Nearctic Microdon flies (Diptera: Syrphidae)". Proceedings of the Entomological Society of Washington (Washington D.C.: Allen Press) 83: 725–758. ISSN 0013-8797. ↑ 3.0 3.1 Duffield R.M. 1981. Biology of Microdon fuscipennis (Diptera: Syrphidae) with interpretation of reproductive strategies of Microdon species found north of Mexico. Proceedings of the Entomological Society of Washington 83: 716-724. This page was last changed on 3 December 2014, at 20:32.